Bitten by the writing bug in my early teens, I finally started writing again in 1996 after half a lifetime of procrastination. Not that I was ever short of good excuses. For 35 years I worked with computers, first as a petroleum geophysicist, then with medical and veterinarian scientists, accountants, engineers, and in a variety of industries, from health care through manufacturing to shipping. My work took me all over Europe, and yet I found the time to marry, build a home, father three kids, and get my golf handicap down to single figures. I have been a full-time writer since 2007. 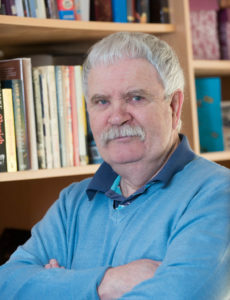 Major writing influences include (in no particular order) Frank O’Connor, James Thurber, Patrick Campbell, PG Wodehouse, Samuel Beckett, Eoin Colfer, Colin Bateman, Ray Galton and Alan Simpson, John Steinbeck, John Le Carré, Robert Harris, Christopher Brookmyre, Richard Dawkins, Ellis Peters, Charles Dickens, Raymond Chandler, Isaac Azimov, John Wyndham, Anne McCaffrey, Robert Sheckley, R. A. Lafferty and, of course, Douglas Adams.